Third Karoshi Lovers album There Is No Alternative is in stores today. Read the interviews from the Sue and Mesta.net, the first review from Rumba and listen to the songs at Ylex's Uuden musiikin iltavuoro. Scream for more. Thanks. Third Karoshi Lovers album titled "There Is No Alternative" will be released on August 24th. Check out the songs "Wrapped In Plastic", "Ties" and "There Is No Alternative" now on Soundcloud and on Myspace. 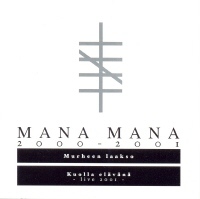 Mana Mana: 2000-2001 2CD (riemucd-013) compilation is re-released. Originally 2005 released double cd includes albums Murheen laakso (riemucd-003) and Kuolla elävänä - Live 2001 (riemucd-008).